» Leatherman Wingman Multi-Tool Review – Versatile Enough? 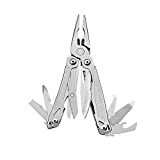 Leatherman Wingman Multi-Tool Review – Versatile Enough? It’s hard to anticipate the sort of problems you might run into out in the world. That’s the purpose of a multitool: it gives you access to a wide variety of tools without forcing you to lug around a whole toolbox. And while it’s not perfect, the Leatherman Wingman is one of the best multitools on the market right now. It’s a very portable, very durable solution to lots of life’s little problems. One of the first things you’ll notice about the Wingman (other than its surprisingly affordable price) is its build quality. Leatherman is famous for making tools that last, and the Wingman can stand up to just about any punishment you throw its way. It is built entirely with high-carbon 420 stainless steel, and it feels solid as a rock in your hand. When it’s folded up, you could throw it at a rock, fastball-style, and I highly doubt it would break. Mine has been dropped, banged-up, and shuffled around in packs for the better part of a year already, and not only does it still work, it still looks brand new. Plus, it comes with a 25-year warranty. Basically, the only way you’ll end up buying a replacement for the Wingman is if you lose it. The Wingman comes with all of the boilerplate tools you’d expect on any multitool: screwdrivers, can and bottle opener, etc. They all work well, but they shouldn’t influence your decision either way, because the same tools are available on virtually every multitool and Swiss army knife on the market. The Wingman does set itself apart from the competition in a few ways, though. First, its pliers are excellent. The handle is spring-loaded, and the pliers do just about everything a pair of pliers from the hardware store can without sacrificing build quality, or even comfort. Even if you’re at home, you’ll find yourself using the Wingman instead of bothering to dig real pliers out of your toolkit most of the time, because it really works just as well. Depending on what you like to do out in the wilderness, you may not have too much use for pliers there, but if you do, you’re not likely to find another pair this good and this portable at this price. The hybrid knife/saw blade is effective and sharp, but because it is a hybrid its uses are limited. You’re certainly not going to be sawing through anything too big with such a small serrated edge, and similarly the straight-knife edge is small enough that for longer-term cutting tasks you might prefer a larger, non-hybrid blade. But the Wingman’s hybrid blade is good enough for most tasks you’ll encounter out in the bush or around the house, from quickly sawing through a rope or vine to slicing the cheese that goes with your wine. Of course, the reason the Wingman sports a hybrid blade rather than two separate blades is that in the space where another blade would be, Leatherman has put a pair of scissors. While they’re not easy or comfortable to use compared to regular scissors, having portable scissors in the tool can come in extremely handy. For example, I often put a bit of leukotape on my heels to prevent blisters before long hikes. The Wingman’s scissors let me cut the tape more cleanly and precisely than a knife would, without forcing me to carry scissors along on the trip. My only complaint is very minor: the scissor pivot point is a rivet rather than a screw, so there’s no way to adjust the scissors’ tension. A tool you won’t find on many of the Wingman’s competitors is the package opener, a sharpened hook of sorts that’s designed to help you get into packages more easily (especially difficult-to-open plastic clamshell packaging). It works pretty well, and although you’re probably not receiving lots of package deliveries during your outdoor pursuits, it’s nevertheless a nice feature to have. For outdoor use, two of my favorite tools are the file and the ruler. If you’ve got anything with sharp points that need sharpening (like crampons or an ice axe), the Wingman’s file can help you make quick adjustments on the trail. And the 1.5 inch ruler is useful for measuring distances on maps, especially if your compass doesn’t include a ruler edge. The downside of the Wingman’s ultra-tough stainless steel construction and the beefy, spring-action pliers is that it’s not the lightest option on the market. At seven ounces, it’s not heavy enough to be a burden to most people, but ultralight hikers and other folks who sweat every extra ounce may find it less than efficient. And if you can do without the pliers, it’s not hard to find alternatives (like a variety of Swiss army knives) that come with many of the same features in smaller, lighter package. One of the things the Wingman does do to cut weight (and cost) is to leave out the leather sheath that comes with some other multitools (although you can purchase a sheath separately). Instead, the Wingman sports a pants clip that makes it easy to attach to a belt or pocket. This is a useful feature for everyday-carry folks, but outdoorspeople who plan to keep the Wingman in their pack anyway may find unnecessary. It’s not like the pants clip adds much weight or takes much away from the Wingman’s ergonomics, but it can occasionally snag on things, and it would be nice if it was removable. Sadly, it isn’t). If those cons seem like minor nitpicks, that’s because they are. The Wingman is a great tool, and while it’s not perfect, it’s close enough that it really has no major flaws. In a word: yes. The Wingman may not be absolutely flawless, but it’s a top-quality multitool with a function list that’s very hard to beat in this price range. It has a tool for lots of the problems you’ll encounter both in the wild and around the house, and it’ll serve you well whether you plan to use it for everyday carry or whether it’s going to live at the bottom of your pack for emergency use on backpacking trips. The only reasons not to buy the Wingman would be if you’re an ultralight purist who wants something lighter (and doesn’t need the pliers), or if you anticipate using the straight blade and saw often enough that you’d rather have a separate blade for each function rather than the Wingman’s hybrid blade. In the latter case, you may want to look at the Leatherman Sidekick, which is very similar to the Wingman but sports a dedicated saw blade instead of the scissors and costs a little bit more. For most people, though, the Wingman is all you’ll need. That’s bad news for multitool manufacturers – once you buy this one, you may not ever need to buy another – but it’s great news for anyone who hasn’t already jumped on the Leatherman bandwagon.